Joel is a professional musician. 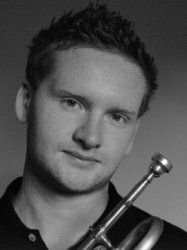 He graduated from the Royal Northern College of Music in 2007 and since then has built up an impressive portfolio career. He has performed with top International orchestras, including the BBC Philharmonic Orchestra, the Royal Liverpool Philharmonic Orchestra, the Halle, Manchester Camerata and Opera North. Outside of Britain, he has worked with the Australian National Ballet, the Australian Urban Circus, Lyon Opera Orchestra and has toured with numerous show companies. As a soloist, Joel is very comfortable with performing on a selection of instruments, including the Piccolo Trumpet, D Trumpet, Bb Trumpet, Cornet and Flugel-horn. This allows for a very varied and interesting recital. He has given recitals in many Cathedrals and Churches nationwide, as well as in Concert Halls and at Arts Centres. Playing a fanfare for the arrival of her Majesty the Queen at Whitworth Hall, (a Manchester University event) in 2008. A performance of Malcolm Arnold's 'Fantasy for Trumpet' at the 'Conservatoire National Superieur de la Music et Danse' in Lyon, France. Appearing as a soloist in 'King Cotton' (a new musical commissioned by the Southbank Centre in 2007). Recording Charpentier's 'Prelude to Te Deum' (trumpet and organ) for 'The Christmas Service' on BBC Radio 4, (broadcast live on Christmas morning 2013). Performing with Inspired Brass as part of a live broadcast from Chester Cathedral for the Easter Service 2015, BBC Radio 4. Joel teamed up with Bath Abbey’s Organist, Shean Bowers to give recitals in Cathedrals and Churches, They have recently recorded their debut album, ‘Jubilation’. Joel also hopes to release a third Christmas album with his Brass Quintet, Inspired Brass, donating profits from CD sales to 'The Christie NHS Foundation Trust', Manchester. Joel is pleased to be the trumpet, cornet and bugle teacher at the Royal Hospital School. A 'Stave House' music teacher and workshop leader. 15 years of private teaching experience with 100% ABRSM and Trinity pass rate. Learning an instrument should be fun. I keep lessons lively and always make sure my pupils know what to practice in between lessons. I play and sing in lessons to demonstrate styles, techniques etc. I expect pupils to put effort in so that they can achieve their full potential. My teaching rates are competetive with an annual review each July. Travel costs are to be discussed.